At first, the title of 92Y’s latest Fridays at Noon showcase seems not quite fitting. New and Nervy implies something risqué and in-your-face. In contrast, the afternoon offers four pieces whose boldness lies in their simplicity. Molissa Fenley, Claire Porter, Susan Thomasson, and Megan Williams, all female artists several decades into their careers, strip away conventional layers in order to place curiosity and investigation front and center in their work. Molissa Fenley presents a new duet and a reconstruction of an older piece. Mix, which premiered at The Kitchen in 1979, energetically opens the afternoon. 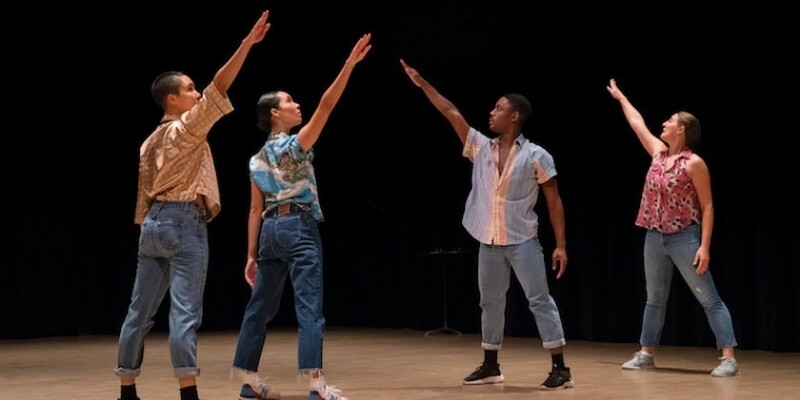 Four dancers in jeans and colorful tops keep collective rhythm with clapping hands and stepping feet. The dancers rarely stay in one place. Their movement, variations on just a few gestures, circles them through and around one another, with symmetry reminiscent of a square dance. The relentlessness of the rhythmic sounds evokes the nature of time, pressing forward at a consistent, unceasing pace, sparing no one. Artifact, a duet between Fenley and Jared Brown, is a different study of time. Fenley and Brown rotate peacefully in silence, usually facing away from one another. Sometimes their phrasing varies, but mostly they move in exact unison. They make contact for the first time when Fenley places a hand on Brown’s shoulder in a comforting, maternal gesture. As these bodies of polar ages and genders shadow one another, we notice the sameness of them. Without visual or sonic cues, they are held together by an innate, organic sense of rhythm. Claire Porter’s Witnessing Adverbs, as quirky and silly as Fenley’s work is serious, sends us on a rollercoaster of a dance-theater piece. Performers Porter and Thomasson detail a mysterious office robbery. Part of a series driven by Porter’s fascination with grammar, Witnessing Adverbs started as a group piece, but was converted to a duo, in which Porter and Thomasson play all character roles. Throughout the work, adverbs like “sneakily,” “gracefully," and the ever-popular “allegedly” are verbally exaggerated and often accompanied by gestures. Witty, poignant, and a tad cheeky, the work highlights how an adverb can both inform movement and change the meaning of a sentence. Witnessing Adverbs delivers a punch at the end. What started as a silly, fantastical story veers to the serious when we are asked to consider what is, in real life, being taken from us. No longer a story about a fictional robbery, it’s about the loss of the environment, science, equality, justice, free press . . . The women walk backward into darkness as they continue to describe what is at risk. 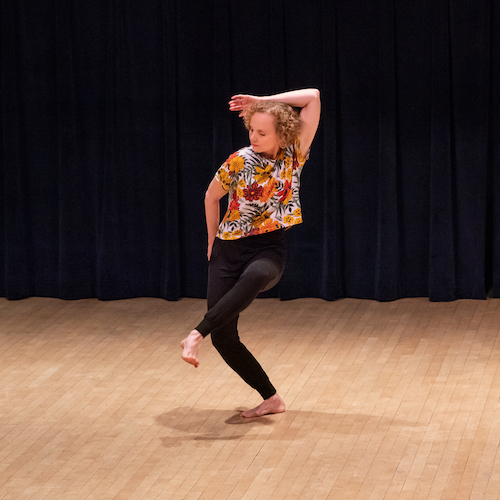 For Megan Williams, who spent a decade dancing for the famously musical Mark Morris, moving away from a prescriptive music choice is a “nervy” decision. 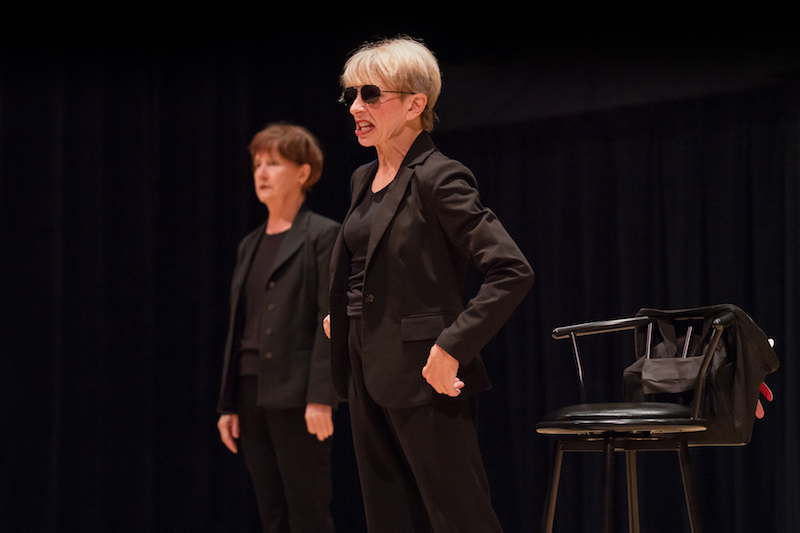 A seasoned performer, she recently ventured into presenting work in a more serious capacity. Play Like a Girl opens with a solo performed by Williams herself. It introduces much of the movement vocabulary that appears throughout the piece. Several actions derive from the title: shy, self-conscious gestures like a delicate hand with curled-up fingers or a foot hesitantly sliding up a leg are juxtaposed with explosive gestures like a big kick. The seven dancers — clad in grey, black and yellow — are agile and powerful. Noteworthy is a solo performed by John Eirich, whose dynamic choices lend meaning to the movement. A long pause at the end of his solo is a punctuating moment within the piece. Williams’ solo never resolves; like a fairy godmother, she introduces the work before scurrying off into the wings. 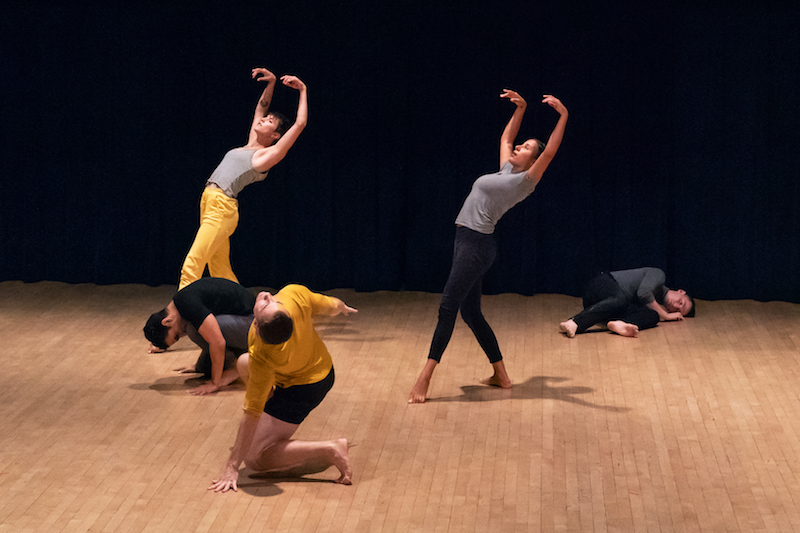 Play Like a Girl feels more like a series of studies exploring choreographic tools like counterpoint, variation, and repetition rather than one cohesive work. While New and Nervy!’s works are unique, some unintended ideas unify the program. Each piece dismisses conventional musical accompaniment. In fact, three use little sound beyond rhythmic and vocal contributions from the dancers themselves with silence and stillness crucial ingredients. Repetition is also thematic — all four works make powerful statements using limited movement vocabulary. In a world of excess, this "less-is-more" philosophy feels new and nervy.